I have an iPad2 that I use for email, playing educational games, and face-to-face sessions with the grand kids. I’m thrilled with the return to the iPad and iPhone of some of the better educational games that once lived only on the PC or Mac. For example, The Incredible Machine, the great Rube Goldberg PC and Mac game, is now available on the iPad. I was especially excited to learn that Lucas Arts has re-released Star Wars Pit Droids, my favorite educational game of them all. The game is available in the iTunes store for the iPhone and iPad for just two bucks! All of our grand kids have access to both computers and iPads so I will be putting Pit Droids on their iPads. Click on the video below to view the opening scene that establishes the context for the story line that underlies the game. Pit droids are transported from level to level by launchers like the one seen in the following video. The droids move from the launcher, in a straight line, until they step on a direction arrow. 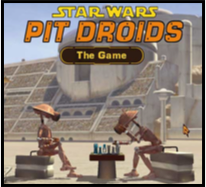 The problem to solve in each puzzle is to get the droids into the correct pits that takes them to the next higher level and, eventually, to the Arena. The original PC/Mac game contained over 300 levels (puzzles) so there is plenty to do. but colored arrows direct only pit droids of that color. Click on the video below to view an example of the use of colored arrows. At the higher levels the problems are challenging for adults. In fact, there's a problem in the original PC version I've never been able to solve!. I even assigned the problem to university math undergrads and it still remained unsolved. I will be curious to learn if that problem is in the iPad version. During the game's development I was often in contact with the lead game designer. The problem with educational computer games is that the better ones do not reflect school curriculum. I know and understand that sequencing is fundamental to creative writing and computer programming (programs are called APPS these days) and that students that are successful playing games like Pit Droids are honing those skills and having fun at the same time. I told the game designer on several occasions that teachers and parents would not see the educational value of the game. I knew that the great educational games of the past (Rocky's Boots, Fix It!, and Robot Odyssey II) all won awards but were financial flops. Teachers and parents never adopted those games. Unfortunately, Pit Droids was also a financial flop and George Lucas soon closed the educational game division of Lucas Arts. I'm thankful the game has been revived. Download the game, play it with the kids, and you will understand why. Thanks Pops! I can't wait for you to help me get this on my I-Pad when we come visit soon!